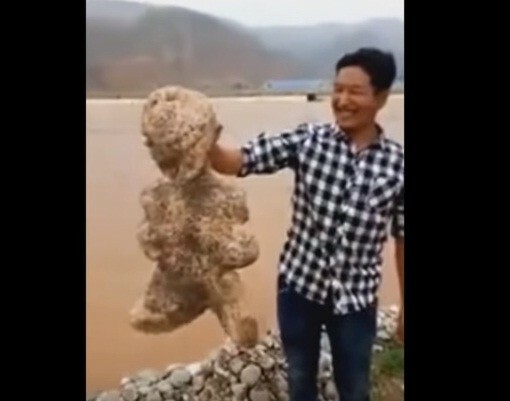 Conspiracy theory YouTube channel 'The Hidden Underbelly 2.0' has uploaded an eerie video on YouTube which shows a strange animal washed ashore on a Chinese beach. The bizarre creature shocked the witnesses at the first glance, and finally, a man showed some courage to pick it up so that he can pose for a selfie with it. When he picked the marine creature up, he was shocked to see the bizarre animal moving its head and limbs. Interestingly, the animal in the eerie clip had a head very similar to that of human beings, and it even had some sort of arms and legs. "This strange looking creature was found floating along the shore of this beach in China. While the man who found this creature is holding it up to show his friend, we can see it moving its legs. The creature seems to have a human-like head with some sort of arms and legs. In my opinion, this could be a new species of sea life or a mutated starfish," wrote the conspiracy theory channel in the video description. The video showing the eerie creature soon went viral on the online spaces, and it has already racked up more than 82,000 views on YouTube. Most of the conspiracy theorists argued that the mysterious animal washed ashore the Chinese beach might be an alien who has colonized the depths of the ocean. As per these theorists, extraterrestrial beings are living on the depths of the ocean, and they claim that the increasing number of UFO sightings above the oceans is a clear indication of alien presence in deep waters. Another section of viewers claimed that the creature spotted could be a mutated sea sponge or starfish. However, skeptics made it clear that this video is a fabricated one uploaded on YouTube just for the sake of publicity. "If it's from China. It's fake. The chances of it being fake are extremely high. That place has fake eggs. Fake rice. Fake milk powder. Fake soy sauce. Stay away from that country westerners! Spend your hard earned cash elsewhere on vacation or sightseeing," commented VTKC, a YouTube user.